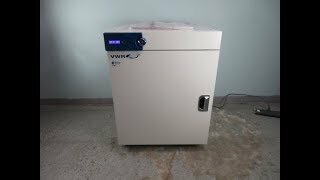 The VWR Gravity Convection Oven 414005-112 offers you microprocessor control, tight accurate heating and excellent uniformity in an easy to use unit. This 5.4 cu ft lab oven has a temperature range of 5° above ambient to 230°C, with a uniformity of ±1.8C at 100°C and minimal fluctuations. This gravity convection oven can be used for a variety of heating functions such as drying samples, outgassing materials, baking and curing, as well as vacuum embedding and moisture testing. The Compact VWR Gravity Convection Oven 414005-112 has advanced microprocessor control that is adaptive for excellent temperature control and accuracy, with optimized airflow and bottom and side heating elements for a uniform chamber. The interior of this lab drying oven is easy to clean stainless steel, with wire shelving that won’t obstruct airflow. This drying oven has a digital control panel with dial knob, from which users can set their temperature and timer requirements, engage the safety lock, and access a sub menu with delay start and offset value. Recovery Time with door open 30 sec. This VWR Gravity Convection Oven 414005-112 is brand new in box and has been tested for functionality. All of our lab equipment comes backed with our standard warranty. Should you have any questions, please don't hesitate to contact us.